At last chambre 2 is ready to welcome guests (although a few of our friends have already had the honour of occupying it before it was finished). Our plumber (Philippe) put in a toilet – where there was none previously – and a new sink and bath, replacing the delightful pink suite. He also ripped off the pink tiles. 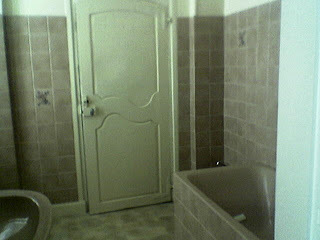 There used to be a connecting door between chambre 1 and chambre 2 through the bathroom. This we blocked up and insulated for sound (no-one wants to hear bathroom sounds in bed – or bedroom sounds in the bath, for that matter). After consulting with some friends, we decided to go with the bold colour we used in the kitchen – yep red again. We also ripped up the vinyl floor and found similar tiles which populate the bathroom of chambre 1 and the downstairs toilet. As with other bits of the house the people laying the vinyl had used cement to level the floor first so I had to spend a fair amount of time cleaning this up.